The aim is to characterize the orientation and isotropy properties of a region of interest (ROI) in an image, based on the evaluation of the gradient structure tensor in a local neighborhood. The theoretical background is fully described in this PDF document. 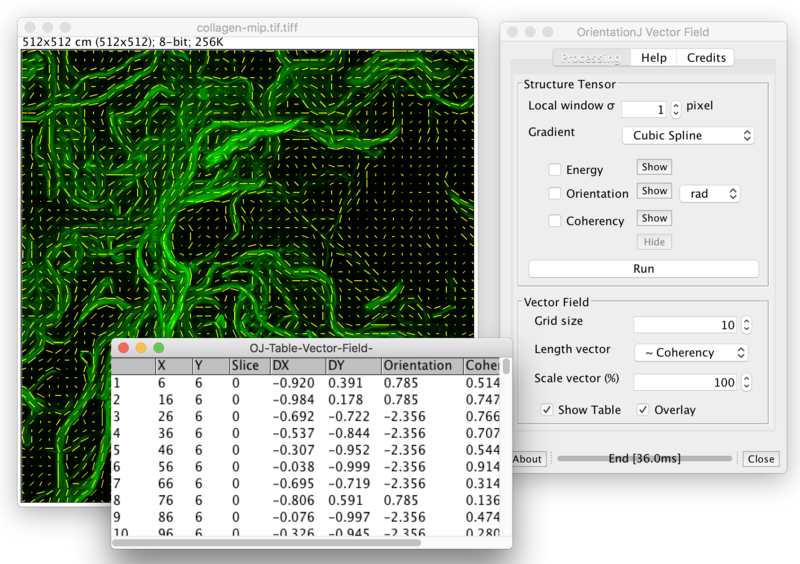 The software package OrientationJ automates the orientation analysis with four functionalities: performing a visual representation of the orientation of a image, creation of a vector field map, plotting the distribution of orientations, and detection of keypoints (Harris Corner). OrientationJ has also others tools: the manual measurement of the orientation and coherency in a ROI, the computation of the dominant orientation, the alignment of images based on the gradient structure tensor and some test images (chirp). 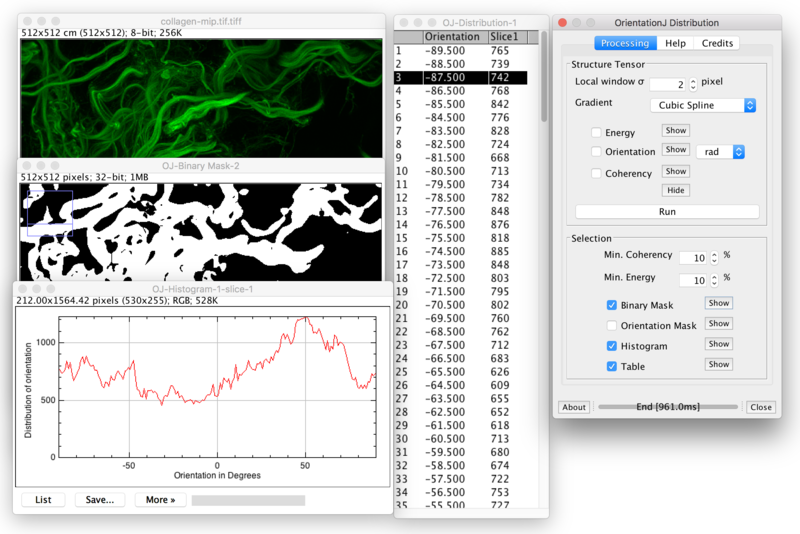 OrientationJ is a software package which consists of a series of plugins for ImageJ and Fiji. It is a open source project available on GitHub. 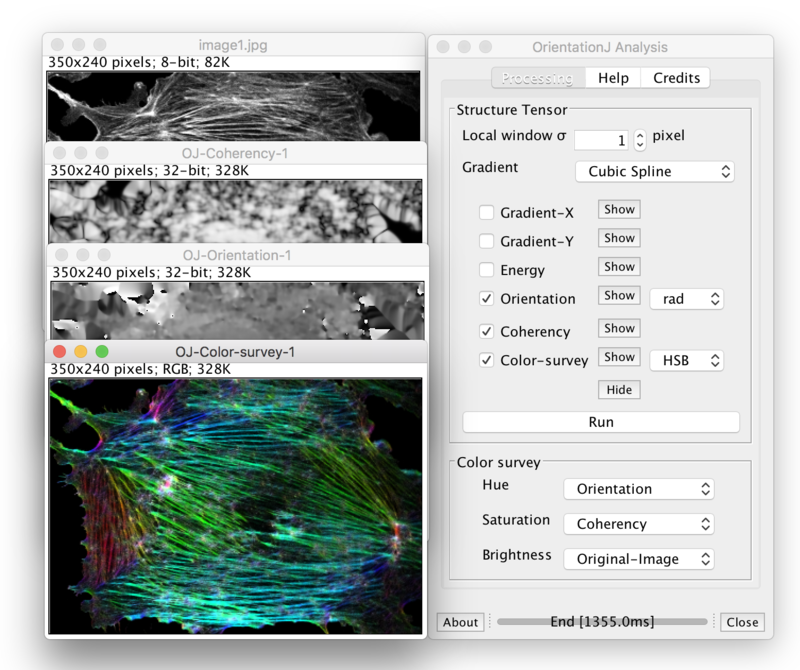 OrientationJ has a companion plugin MonogenicJ that performs multiresolution directional image analysis. Advances in Anatomy, Embryology and Cell Biology, vol. 219, Springer International Publishing, ch. 3, 2016. Biomechanics and Modeling in Mechanobiology, vol. 11, 2012. Stroke, vol. 40, no. 7, 2009. Circular color map coding, Courtesy of Urszula Zajaczkowska. 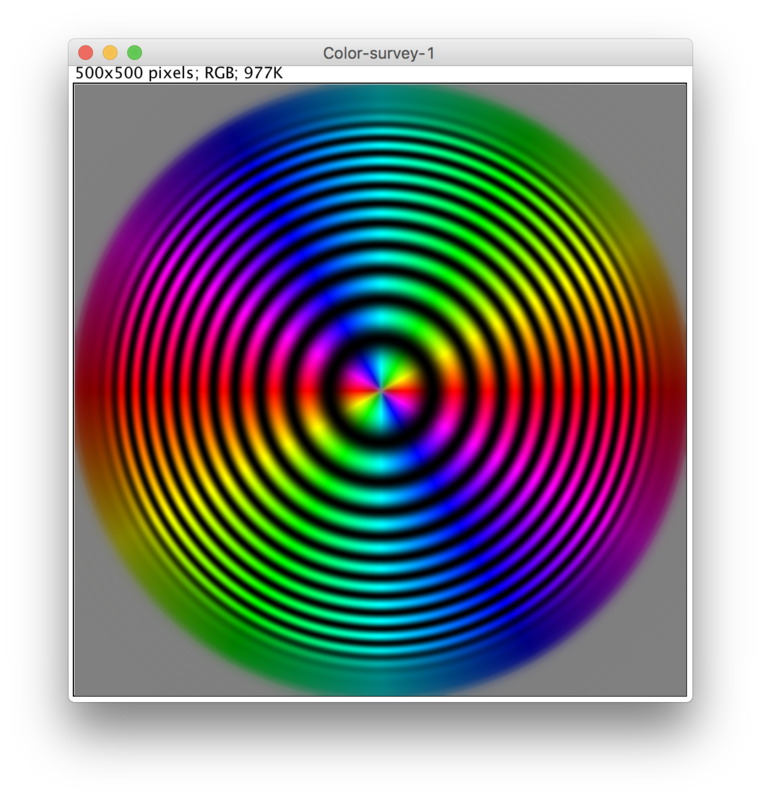 Qualitative or visual mode: the user specifies the size of a Gaussian-shaped window, and the program computes the structure tensor for each pixel in the image by sliding the Gaussian analysis window over the entire image. The local orientation properties are computed according to the equations above and are then visualized as gray level or color images with the orientation being typically encoded in the color (hue). In the left example, the original image (source) is used as input of the structure tensor computation. The program computes the local orientation and the local coherency. The feature are gather in color map in HSB mode, e.g, hue is orientation, saturation is coherency, and brigthness is the source image. Reference: Z. Püspöki et al., Transforms and Operators for Directional Bioimage Analysis: A Survey, Advances in Anatomy, Embryology and Cell Biology, vol. 219, Springer International Publishing, ch. 3, 2016. Courtesy of Carole Aemisegger, ZMB, University of Zürich. Courtesy of Rana Rezakhaniha, LHCT, EPFL, Lausanne. 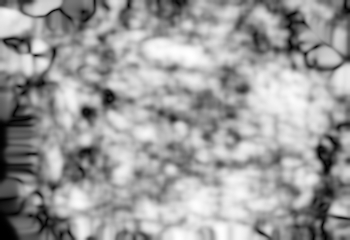 The orientation is evaluated for every pixel of the image based on the structure tensor. 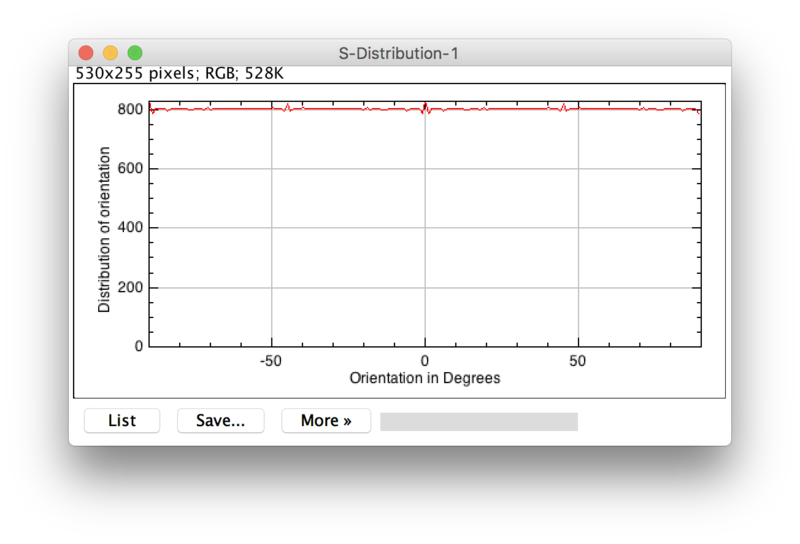 A histogram of orientations is built taken into account the pixel that have a coherency larger than min-coherency and an energy larger than min-energy. The histogram is a weighted histogram, the weigth is the coherency itself. The min-coherency is expressed is % since the coherency factor is a index between 0 and 1. 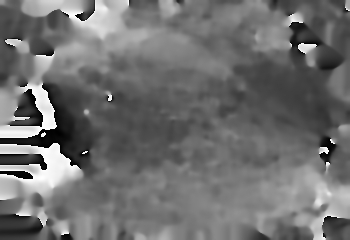 The min-energy is expressed in % of the maximum energy of the image. 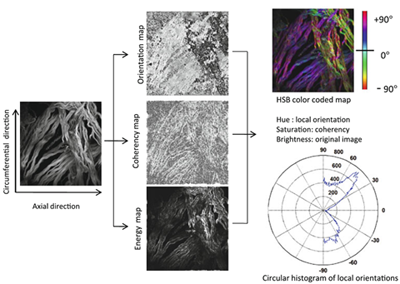 Reference:: R. Rezakhaniha et al., Experimental Investigation of Collagen Waviness and Orientation in the Arterial Adventitia, Biomechanics and Modeling in Mechanobiology, vol. 11, 2012. The orientation is evaluated for every patch of the image based which allows to visualize the orientation of the vector. The module of the vector is usually proportional to the coherency and a scale factor provided by the user. Courtesy of Edouard Fonck, LHCT, EPFL, Lausanne. Quantitative mode: the user specifies a sequence of ROIs and the software saves the corresponding orientation features in a spreadsheet. The weighting function in this mode is the ROI window with uniform weights. Reference: E. Fonck et al., Effect of Aging on Elastin Functionality in Human Cerebral Arteries, Stroke, vol. 40, no. 7, 2009. 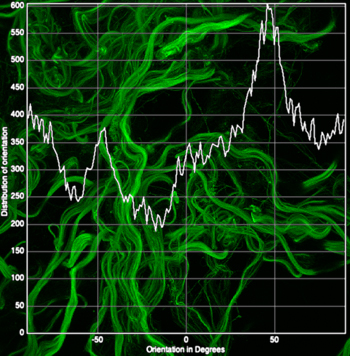 Based on structure tensor computation, the Harris index is evaluated. The local maximum of the Harris index represent corners in images. We provide a software OrientationJ to produce to visualize and to measure the orientation in the images. 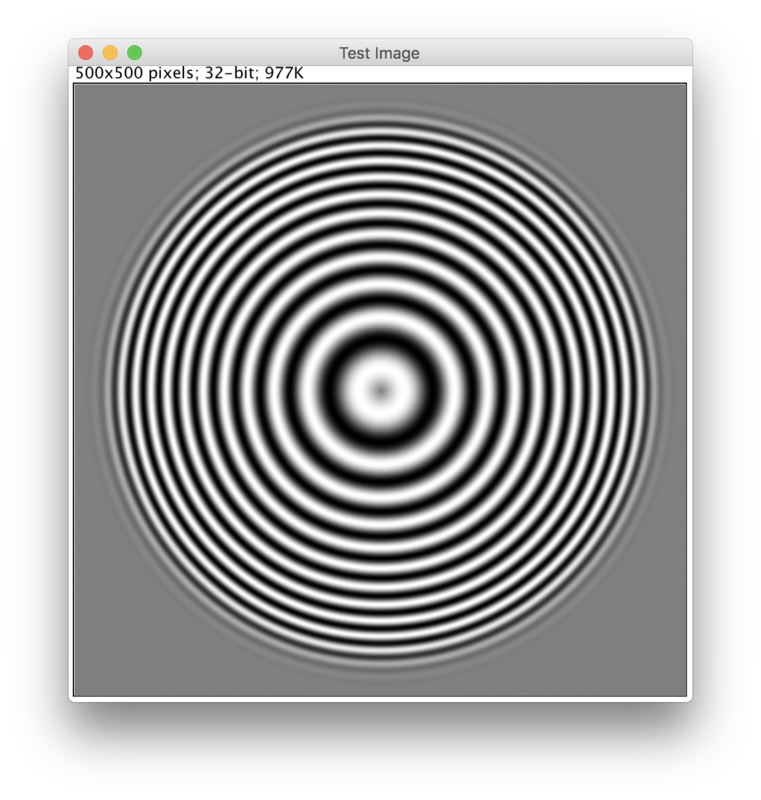 This software package is a series of plugin running on ImageJ, Fiji, or ImageJ2 a general purpose image-processing package. ImageJ has a public domain licence; it runs on several plateforms: Linux, Windows, Mac OSX. 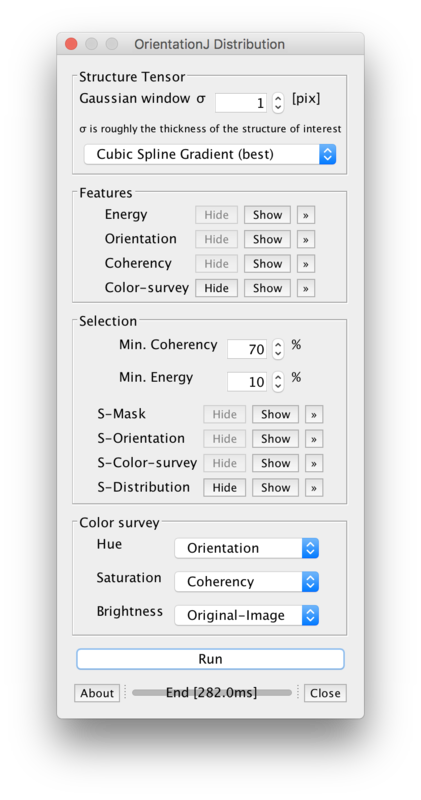 OrientationJ Analysis: Full interface to access to all features of the structure tensor and create color survey. OrientationJ Measure: Make measurement of the orientation and the coherency inside reion of interest. 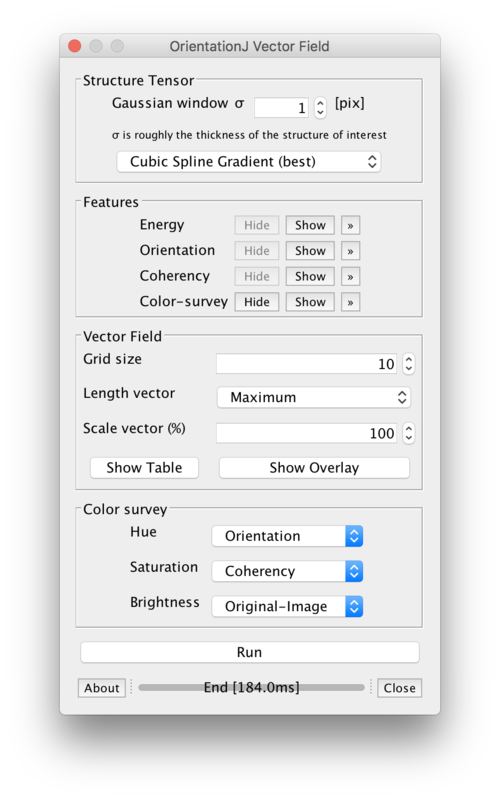 OrientationJ Distribution: Build a histogram of orientations based on selected structures. 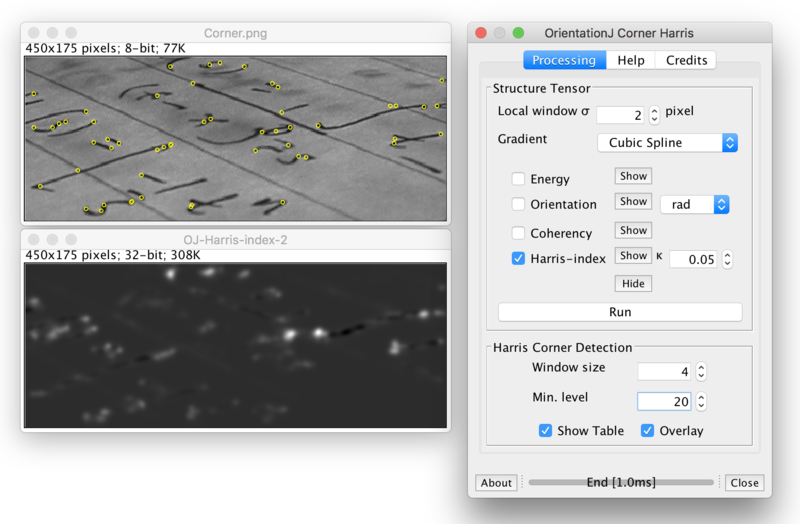 OrientationJ Corner Harris: Find corners in an image based the Harris corner detection. OrientationJ Vector Field: Evaluate the direction by regular patches. Test Image: Create a test image. Manual installation: Download the last version of the plugin: OrientationJ_.jar and put the file OrientationJ_.jar into the "plugins" folder of ImageJ. Automatic installation (Fiji, Image2): Using the built-in updater of Fiji, check the site BIG-EPFL (http://sites.imagej.net/BIG-EPFL/). 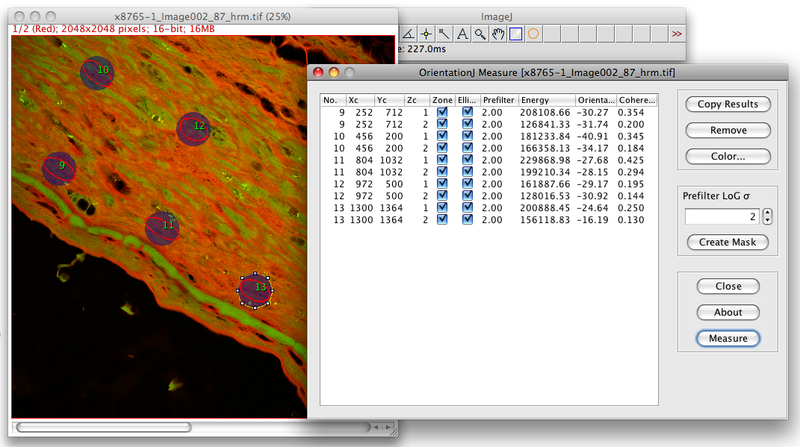 The OrientationJ plugins are recordable on ImageJ. You are free to use this software for research purposes. In addition, we expect you to include adequate citations and acknowledgments whenever you present or publish results that are based on it. Reference: Erica E. Morrill, Azamat N. Tulepbergenov, Christina J. Stender, Roshani Lamichhane, Raquel J. Brown, Trevor J. Lujan, A validated software application to measure fiber organization in soft tissue Biomechanics and Modeling in Mechanobiology, December 2016. 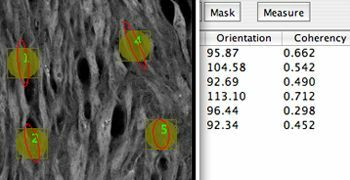 DiameterJ is a validated nanofiber diameter characterization tool. 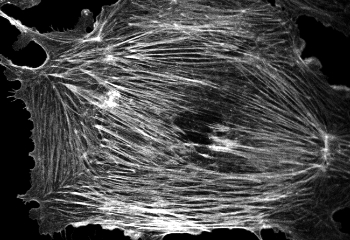 DiameterJ is able to analyze an image and find the diameter of nanofibers or microfibers at every pixel along a fibers axis and produces a histogram of these diameters. Reference: Hotaling NA, Bharti K, Kriel H, Simon Jr. CG. DiameterJ: A validated open source nanofiber diameter measurement tool. Biomaterials 2015. 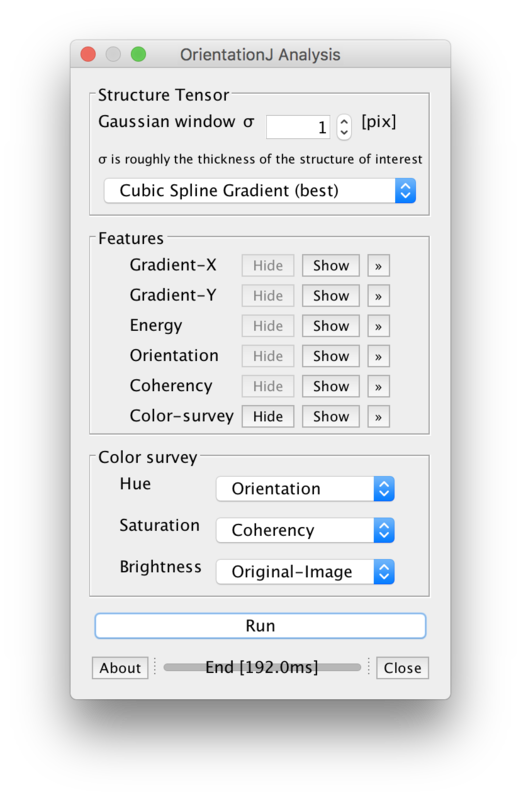 This plugin is used to infer the preferred orientation of structures present in the input image. It computes a histogram indicating the amount of structures in a given direction. S.A. Sampath et al., Trabecular orientation in the human femur and tibia and the relationship with lower-limb alignment for patients with osteoarthritis of the knee, Journal of Biomechanics 48, Issue 6, 2015. Urszula Zajaczkowska, Ordering of the cellular arrangement and xylogenesis in wounded shoots of willow, International Association of Wood Anatomists Journal 36, 387-399, 2015. M. Sharabi et al., Laminated collagen-fiber bio-composites for soft-tissue bio-mimetics, Composites Science and Technology 117, Elsevier, 2015. T. Fee et al., Image?based quantification of fiber alignment within electrospun tissue engineering scaffolds is related to mechanical anisotropy, Journal of Biomedical Materials Research 104(7), Wiley, 2016. D. Changqin et al., Second Harmonic Generation of Unpolarized Light, Physical Review Letters 119, 2017. J. Hertz et al., A tunable synthetic hydrogel system for culture of retinal ganglion cells and amacrine cells, Acta Biomaterialia 9, 2013. 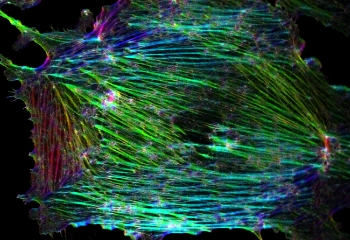 T. D. Clemons et al., Coherency image analysis to quantify collagen architecture: implications in scar assessment, RSC Advances, Royal Society of Chemistry 8, 2018. S. P. Carey et al., Leading malignant cells initiate collective epithelial cell invasion in a three-dimensional heterotypic tumor spheroid model, Clinical & Experimental Metastasis 30, 2013. J.P. Wu et al., High?resolution study of the 3D collagen fibrillary matrix of Achilles tendons without tissue labelling and dehydrating, Journal of Microscopy, 2017. M. Rosalien et al., Mechanical characterization of arterial tissue: Simultaneous confocal imaging and tensile testing, Proceedings of the 3rd Joint Workshop on New Technologies for Computer/Robot Assisted Surgery, 2013. D. U. Shaha et al., The biocomposite tube of a chaetopterid marine worm constructed with highly-controlled orientation of nanofilaments, Materials Science and Engineering: C, Volume 48, 1 March 2015. F. Gesellchen et al., Cell patterning with a heptagon acoustic tweezer ? application in neurite guidance, Lab Chip, Royal Society of Chemistry 14, 2014. M. WinklerMelinda et al., A microfabricated, optically accessible device to study the effects of mechanical cues on collagen fiber organization, Biomedical Microdevices 16, 2014.